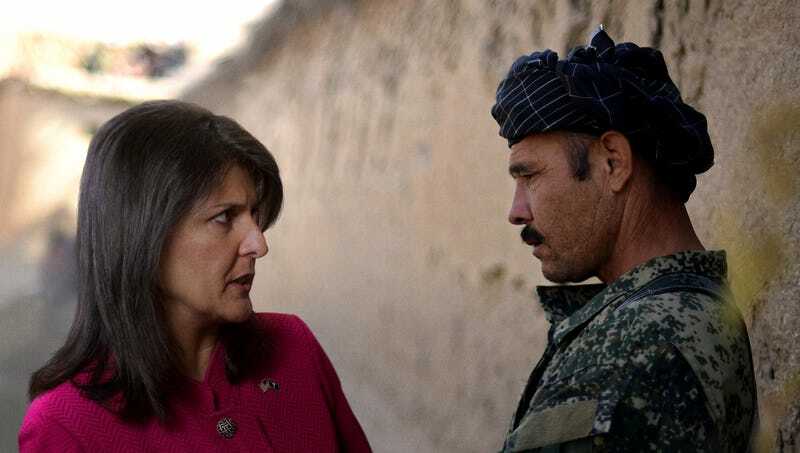 NEW YORK—Saying she hoped the new position would allow her to grow both personally and professionally, Nikki Haley announced Tuesday she would resign from her post as U.S. ambassador to the United Nations in order to accept a consulting role with an Afghan warlord. “While I have greatly enjoyed my time in the Trump administration, this opportunity fits my skill set so well that I felt I couldn’t pass it up,” said Haley, adding that the job with a warlord she declined to name would permit her to continue in her career path while pursuing her passions for paramilitary operations, intimidation, propaganda, and torture. “I’m thrilled to begin this new adventure working alongside a true strongman, someone I have long admired for his ability to get things done. I believe the role I played at the U.N. has provided me with the experiences I need to help him consolidate his power and expand his reign of terror, putting him in a better position to take control of his war-torn homeland.” Haley went on to express her hope that with a little hard work, she could help her new employer become the next Butcher of Kabul.